Analyzes entire machining systems while covering milling, boring, turning, grinding, and related CNC tooling. References individual CNC commands by graphical representation of the toolpath and the surfaces produced. Every generic command is cross-referenced by industry standard CNC machine formats and illustrated by the surface, machine movement, or toolpath that results from using the individual commands. Allows users of precision machining centers and high-rate material removal systems to become better and more successful programmers. CNC Systems. The Precision Measuring and Position of CNC. Programming; Special Control-Geometry Capability. Programming Tool Motions. 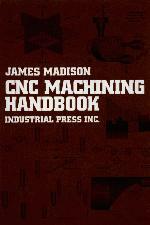 CNC Operation Selection. Programming Standard Milling and Boring Center Motions. Programming Complex Milling and Boring Motions. Programming Standard Turning Motions. Programming Complex Turning Motions. Programming CNC Grinding Motions. Subroutines and Compensation. CNC Compensation. Useful Programming Formulas, Commands and Tables, CNC Tooling; CNC Tooling for Turning Centers; CNC Tooling for Grinding; CNC Operation; Grinding and Turning Operational Sequences. CNC Forms and Worksheets.